One or two piece black undersuit. Commonly used components include sports compression wear, warm-up suits, dance unitards, or diveskins. Undersuit must be smooth in appearance or with vertical ribbing with no labels or logos visible once the armor is on. Black over the wrist gloves made of leather, nylon, or other low pile fabrics. Gloves must not show any labels or logos once the armor is on and cover any exposed skin. Neck seal to be black in color with vertical ribbing or being smooth in appearance. No logos or labels are to be visible. If the seal is not incorporated as part of the undersuit, a balaclava or other similar covering is acceptable. 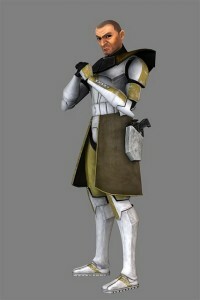 The Clone Wars animated style clone helmet – Fanmade bucket. Some “name brand” helmets may be unacceptable. Helmet Fin on dome painted Golden Yellow. Golden Yellow stripe down center, tapering slightly toward the “chin” and upwards just past the helmet fin. Macro binoculars (animated style) mounted to “ear” area. 4 black vents on each side of helmet. Chest – Chest and back plate should match together at the sides with no gap, just a seam line. Golden Yellow strip down center. Back – Chest and back plate should match together at the sides with no gap, just a seam line. One holster on each hip, hanging from either the belt or attached to the kama. NOTE: Animated pistols and holsters are larger than the realistic props.